The holidays are an exciting time for kids. Christmas trees, time off from school, cookies and of course, presents. All of the excitement around the holidays can feel self indulgent and make it easy for kids to forget that it’s a spectacular time for giving. It’s our job as parents to show them how to express empathy and compassion for others. As you’re sitting down for dinner this week, talk about the importance of generosity and giving and the impact your family can make on others this season. Below are some ideas to consider. Then as a family, pick out an activity or two you all like and can do together. Buy gifts for children in need. Toys for Tots is a national campaign to provide families in need with gifts for children. Their website includes a list of drop-offs around the country. You can also look for locations with an angel gift tree (many churches and retail stores have them during the holiday), where you select an angel with the age and gender of a child and purchase a gift for them. Sponsor a child. A gift that will last all year, sponsoring a child is a great way to keep the spirit of giving throughout the year. With most programs, you will receive letters, photos and cards throughout the year, and you are encouraged to do the same. This is a great way to continually show your child the impact of their decision to give. Send holiday cards or gifts to serving military men and woman. You don’t have to spend money on this one. You can simply create holiday cards for military men and women serving overseas. If you have a budget for gifts, Military.com has a list of organizations that collect books, commissary gift certificates and more for serving members of the military. Ring Bells for the Salvation Army. If you want to get out and serve your community, ringing bells for Salvation Army is one of the most festive ways to experience the holidays from the serving side and fill the red kettle. Serve in a soup kitchen. Another way to psychically get out into the community is to visit a local soup kitchen or homeless facility that serves meals around the holidays. Clean out closets and toy boxes and donate. Remind your child how much they have by taking an inventory of their toys and clothes. Donate what they don’t need anymore to a local shelter or second-hand store that donates the proceeds to charity. Make dinner for a family or elderly person in need. Have a little fun in the kitchen and allow your child to help prepare a meal that can be easily portioned out and delivered to a family or person in need. Deliver a dessert or tray of cookies to public or civil servants on Christmas. Show your kids that not everybody is able to spend the holidays with their family. Take them to see the hard-working people who commit to serving the public over the holidays, and drop off holiday treats to police officers, firefighters, or hospital workers. If you are traveling, volunteer in the local community. If you happen to be traveling during the holidays, you can still participate and volunteer in the local community teaching your children that where doesn’t matter. By teaching your children selfless giving, you are giving them a gift far more powerful than presents under the Christmas tree. 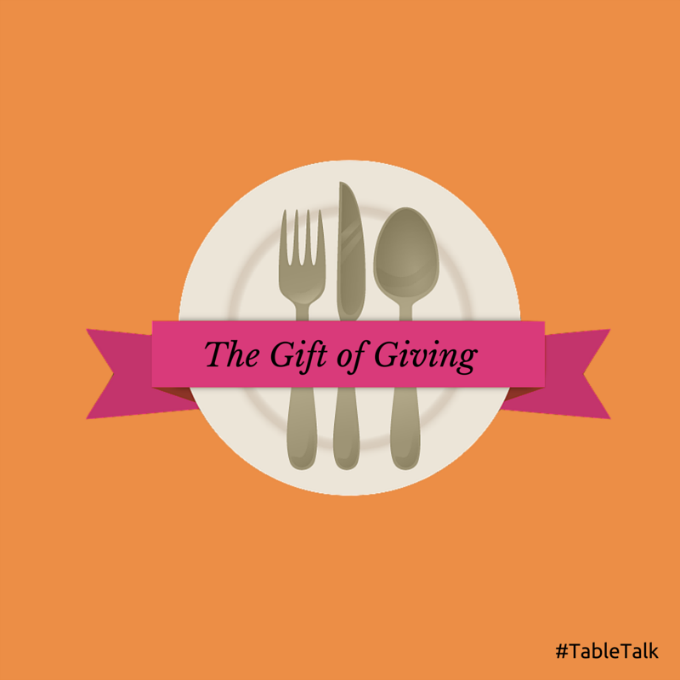 For more ideas on dinner discussion ideas that can help your family connect, learn and grow, check out our series at Table Talk Topics.